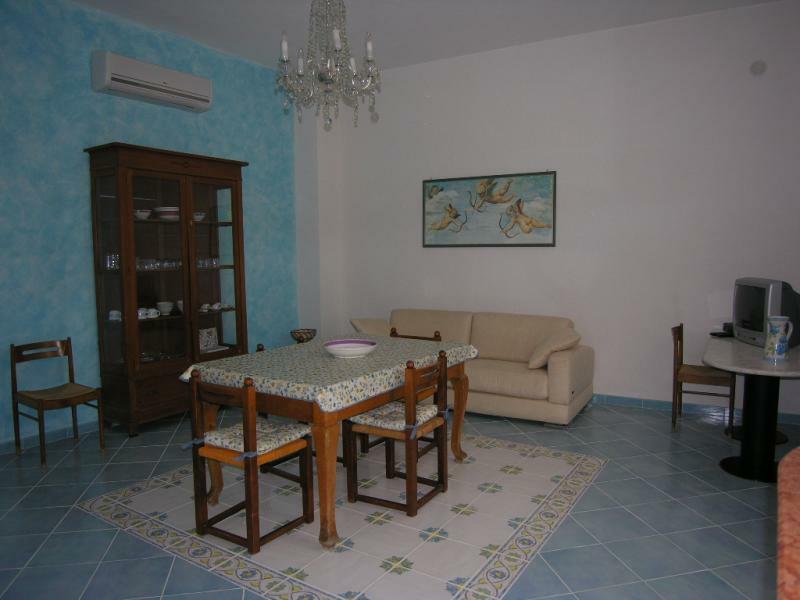 At a few steps from Guidaloca beach which is situated in the gulf of Castellamare del Golfo (TP), on the top of a sea cliff , you can find this ancient block fractioned in 4 apartments. A quick staircase positioned very close to the apartment bring directly to a stones and sand beach with a crystal clear sea. From the windows of the bedroom you can enjoy a beautiful view of the bay. The village of Castellamare del Golfo is situated at around 6 km and there you can find any type of shops, banks, chemists, post office, hotels and restaurants. S. Vito lo Capo is at 25 Km, Erice at around 30 Km, Segesta at 35 Km, Trapani at 40 Km and Palermo with its airport at 45 Km. 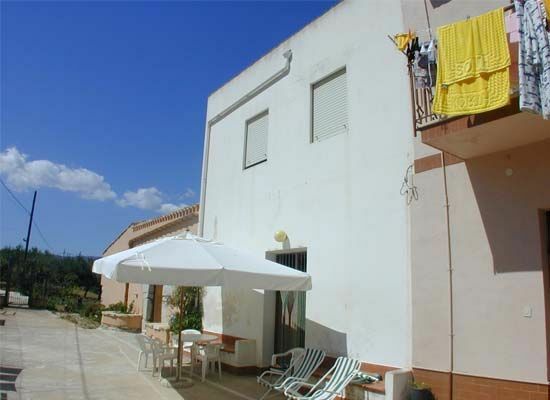 The apartment extends on two levels and it has a yard at the front in common with the other apartments but equipped with a table , chairs and a beach umbrella. On the ground floor there is a wide living room, a bathroom with a shower, a utility room and a kitchen fully equipped. From a staircase in the living room you can access the first floor where there are two wide double bedrooms , one of which with an extra bed and another bedroom with 3 single beds. A steep staircase of approx 120 steps , located at a few steps from the house, leads directly to the beach of Guidaloca, with sand and little stones with a clear sea. One part of the beach is equipped with sun-umbrellas and deck chairs. During summer months there is also a children play field. The Natural Park of Zingaro is at a 3 km distance and there guests can have a nice walk in the wild nature with lots of little hidden beaches. 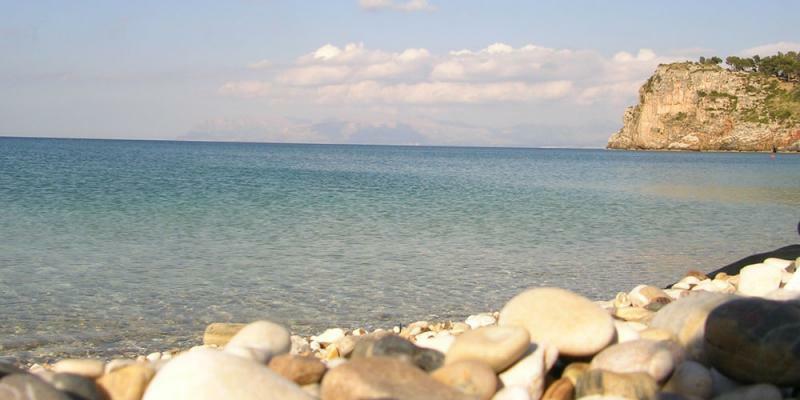 Scopello with its famous tuna fish breeding is at 2 km, Segesta with its temples are at 25 km. 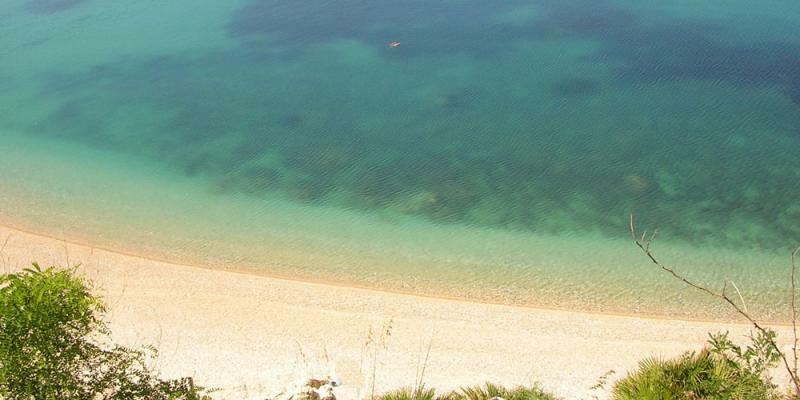 San Vito lo Capo with its white and pink beaches is at 20 km, Castellammare del Golfo with all kind of shops is at 7 km. 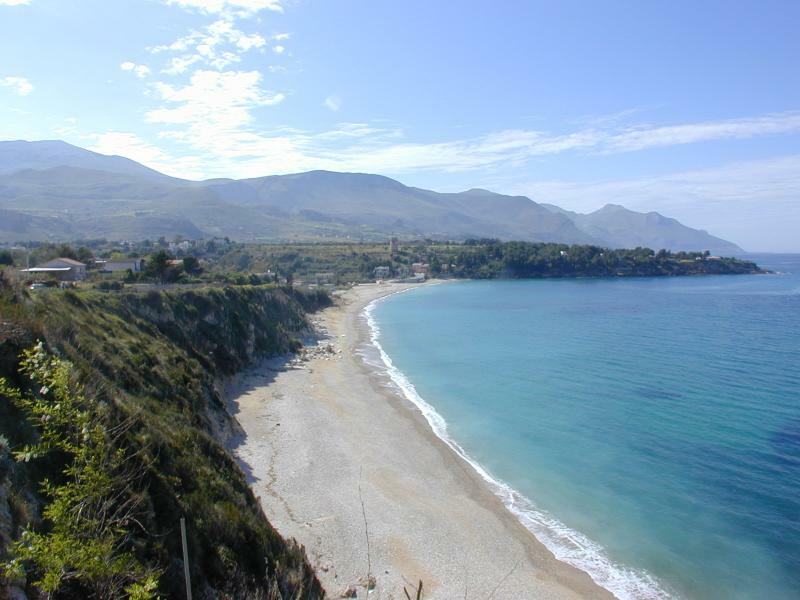 From Palermo take the Highway A29 direction TRAPANI – MAZARA DEL VALLO and drive on for about 40 km. Exit at CASTELLAMMARE DEL GOLFO and keep driving on the four lanes road, arriving until the village of Castellammare. Once arrived on the local road, at about 600 meters after the end of the four lanes, you will see on your left an IP petrol station, in front of a bakery shop “ La Sorgente”. Stop there and call the owner at the number +39-338-7593780. 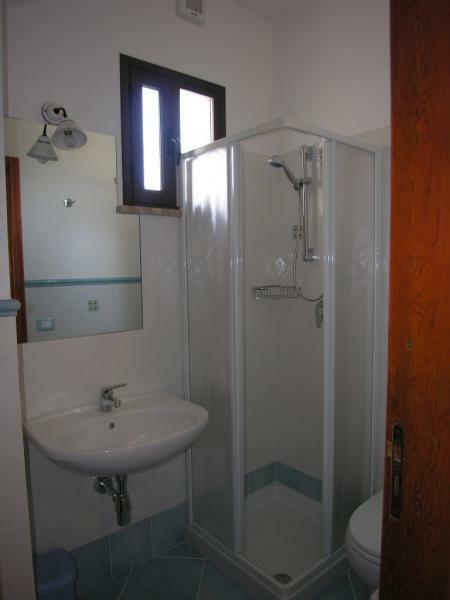 He will come or will send someone to pick you up to accompany you at the apartment Zanina that is situated in Loc Guidaloca, contrada Ciauli at approx 7 km. 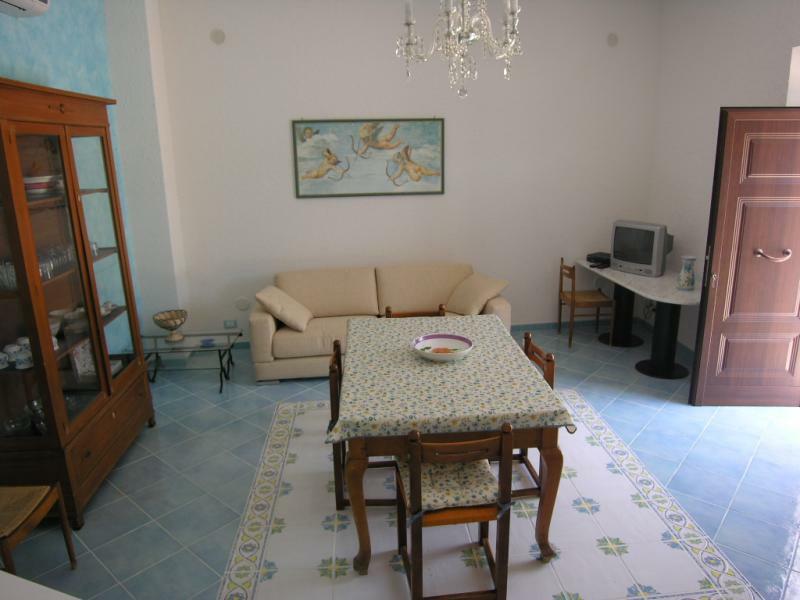 Great apartment located in a great location near the sea. Comfortable to reach and with private parking. Great cleanliness of all spaces and very functional. Extreme availability of the owner of the house. Ottimo appartamento situato in una ottima posizione vicino al mare. Comodo da raggiungere e con parcheggio privato. Ottima pulizia di tutti gli spazi e molto funzionale. Estrema disponibilità del proprietario della casa. Thank you guys, you were great guests in all directions. I look forward to you next year! I greet you with a hug. Grazie ragazzi, siete stati ottimi ospiti in tutti i sensi. Vi saluto con un abbraccio. 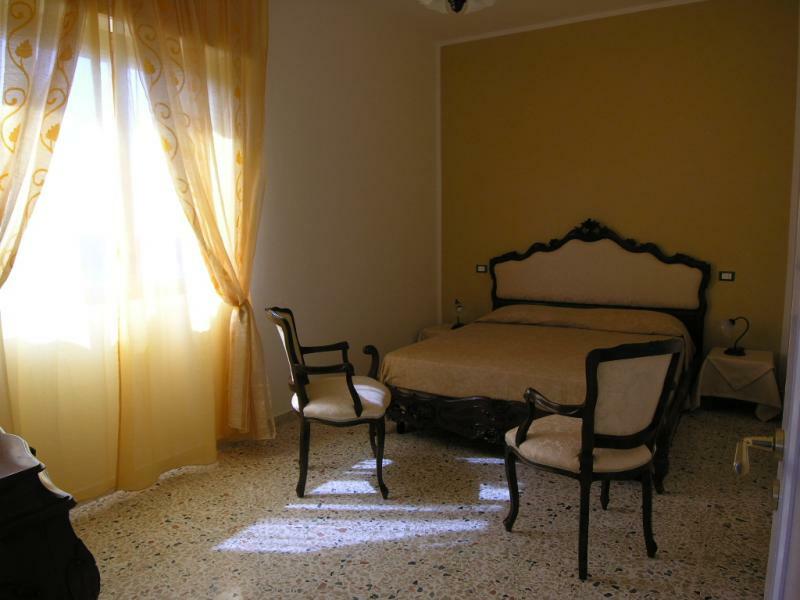 The house, very comfortable and spacious and equipped with everything you need, has allowed me and my family to enjoy a week in one of the most beautiful places in Sicily. Extremely convenient also access to the sea, literally a stone's throw away from home, so we have completely forgotten to use the car. The owner, Mr Alberto, welcomed us with a sense of uncommon family hospitality, making us always feel at home and even made to find a earring my wife had lost in the house. Thank you very much for everything! La casa, molto comoda e spaziosa e dotata di tutto il necessario, ha permesso a me ed alla mia famiglia di potere piacevolmente trascorrere una settimana in uno dei posti più belli della Sicilia. Estremamente comodo anche l'accesso al mare, letteralmente a due passi da casa, per cui ci siamo completamente dimenticati di usare l'auto. Il proprietario, il Sig. Alberto , ci ha accolto con un senso di ospitalità familiare non comune, facendoci sempre sentire a casa nostra, e si è persino dato da fare per ritrovare un orecchino che mia moglie aveva perso in casa. Lo ringrazio di tutto particolarmente! Thank you Petra and Federico, you are a nice family. Grazie Petra e Federico, siete una bella famiglia. Thank you very much, it was a pleasure to welcome you! I hope to come back soon, a warm greeting. La ringrazio molto, è stato un piacere ospitarvi! Spero torniate presto, un caro saluto. I found this site on the announcement, I consulted with another family and we decided to use in communion the proposed apartment !! Mr. Galante as well as meet the every need, also arranged the transfer from Palermo -scopello and rental cars! All at reasonable prices and availability! We recommend the full place. Ho trovato su questo sito l'annuncio ,mi sono consultato con un'altra famiglia e abbiamo deciso di utilizzare in comunione l'appartamento proposto !! il signor Galante oltre che esaudire tutte le richieste , ha pure organizzato il transfert da palermo -scopello e noleggio auto !Tutto a prezzi modici e con disponibilità! Noi consigliamo a pieno il posto. The house is beautiful but would need a more thorough maintenance as a few things in particular relating to the external of the house is in poor condition (drying room, garden chairs umbrella) Cleanliness is not satisfactory. Very positive the proximity to the sea very nice. La casa è molto bella ma avrebbe bisogno di una manutenzione più accurata in quanto alcune cose in particolare relative all'arredo esterno della casa sono in condizioni pessime (stenditoio, sedie da giardino ombrellone) La pulizia non è soddisfacente. Molto positiva la vicinanza dal mare molto bello. If he had contact immediately, it would intervene immediately to resolve the breaks and I sent our Governate to ask you a supplementary cleaning. Now after three months, I can only record the unflattering comments, helpful, in spite of myself, for the future. Greetings. La ringrazio per il prezioso giudizio. Se mi avesse contatto subito, sarei intervenuto immediatamente per risolvere le rotture e avrei inviato la nostra Governate a farle una pulizia suppletiva. Adesso dopo 3 mesi, posso solo registrare il poco lusinghiero commento, utile, mio malgrado, per il futuro. Saluti. I spent at Grandma's house two weeks in October 2014, and have been the most enjoyable you can imagine. 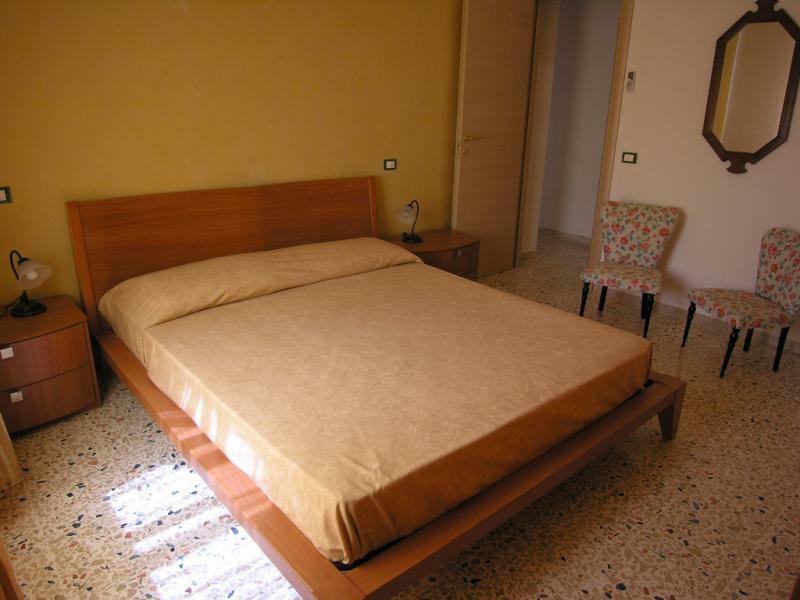 The great house, spacious, bright and equipped with everything, strategic position just above a lovely beach and a few km from Scopello, Castellammare warm and the river, the hospitality and the good organization of the owners, as well as the good fortune of a good climate have made the stay really ideal. Once again I thank the generosity and willingness of Mr. Galante for having managed in the best way my needs, since I had to first delete, then change the last reservation due to serious family reasons. Hope to be back soon! Ho trascorso presso casa della Nonna 2 settimane a ottobre 2014 e sono state quanto di più piacevole si può immaginare. L’ottima casa, spaziosa, fornita di tutto e luminosa, la posizione strategica esattamente sopra una spiaggia incantevole e a pochi km da Scopello, il fiume caldo e Castellamare, l’ospitalità e la buona organizzazione dei proprietari, nonché la fortuna di un ottimo clima, hanno reso la permanenza veramente ideale. Ringrazio ancora la generosità e disponibilità del signor Galante per aver gestito nel migliore dei modi le mie esigenze, avendo io dovuto prima cancellare, poi modificare all’ultimo la prenotazione a causa di seri motivi familiari. Spero di poter ritornare al più presto! We were delighted to return to "Grandma's house ". L 'house is always comfortable, the gorgeous scenery and the very friendly owner. Positive experience that we recommend !! Siamo stati lieti di tornare alla "casa della Nonna". L' abitazione è sempre confortevole, il panorama meraviglioso ed il proprietario molto ospitale. Esperienza positiva che raccomandiamo!! We spent a pleasant holiday, the place was very nice, the house where we were staying stylish and comfortable. Everything nice, except quell'ingannevole setgnaletica "Parking with parking disc " in the charming village of Scopello. In a few hours we did not know that the disc was worth even at night, especially in an area where you can leave the car does not involve obstructing traffic, instead leaving the restaurant, late at night, we had the surprise to find, along with many other tourists, a fine. Maybe we were wrong to not put the car in the parking area adjacent to the privately run with a parking disc? The fine will pay for it, but we need more respect for anyone visiting places so beautiful, dear mayor of Castellammare del Golfo. Abbiamo trascorso una piacevole vacanza, il luogo era molto bello, la casa dove alloggiavamo elegante e confortevole. Tutto bello, tranne quell'ingannevole setgnaletica "Parcheggio con disco orario" nell'incantevole frazione di Scopello. In pochi non sapevamo che il disco orario valesse anche di notte, soprattutto in una zona dove lasciare la macchina non comporta intralcio al traffico, invece usciti dal ristorante, a tarda sera, abbiamo avuto la sorpresa di trovare, insieme a tanti altri turisti, una multa. Forse abbiamo sbagliato a non mettere la macchina nel parcheggio a pagamento gestito da privati e adiacente all'area con disco orario? La multa la pagheremo, ma occorre più rispetto per chiunque visiti posti così belli, caro sindaco di Castellammare del Golfo. I spent a wonderful holiday in Scopello in the house of the grandmother of Mr. Alberto Galante, who is immediately demonstrated a kind and always available. The house was very comfortable and cozy, clean and had everything in it that can serve for a wonderful holiday. The house was also located in a very quiet place. But the thing that really got me excited was the fact that I could sleep at night hearing the sound of waves, sound, light and sweet, like a lullaby of the sea ... In fact, the house was just a few meters from the sea, on the top of a staircase on the area above. The areas and neighboring countries are gorgeous, the same Palermo is charming and very friendly people. I thank Mr. Galante and Mrs. Lina, for their kindness, helpfulness and courtesy. Ho trascorso una meravigliosa vacanza a Scopello nella casa della nonna del signor Alberto Galante, il quale si è dimostrato fin da subito una persona gentile e sempre disponibile. La casa era molto comoda ed accogliente, pulita e al suo interno c'era tutto cio che può servire per una splendida vacanza. La casa era inoltre ubicata in un posto molto tranquillo. Ma la cosa che mi ha veramente emozionato è stato il fatto che alla sera mi potevo addormentare sentendo il rumore delle onde, un suono lieve e dolce, come una ninna nanna del mare... la casa infatti era a pochi metri dal mare, posta in cima ad una scalinata sulla zona soprastante. Le zone e i paesi vicini sono stupendi, la stessa Palermo è affascinante e la gente molto cordiale. Ringrazio il signor Galante e la signora Lina, per la loro gentilezza, disponibilità e cortesia. The beautiful beach, 10 meters from the apartment, the latter very clean and spacious. Good reception and car parking. Bellissima la spiaggia, a 10 mt dall'appartamento; quest'ultimo molto pulito e spazioso. Buona l'accoglienza e il parcheggio dell'auto. Beautiful place, great house, comfortable and clean. 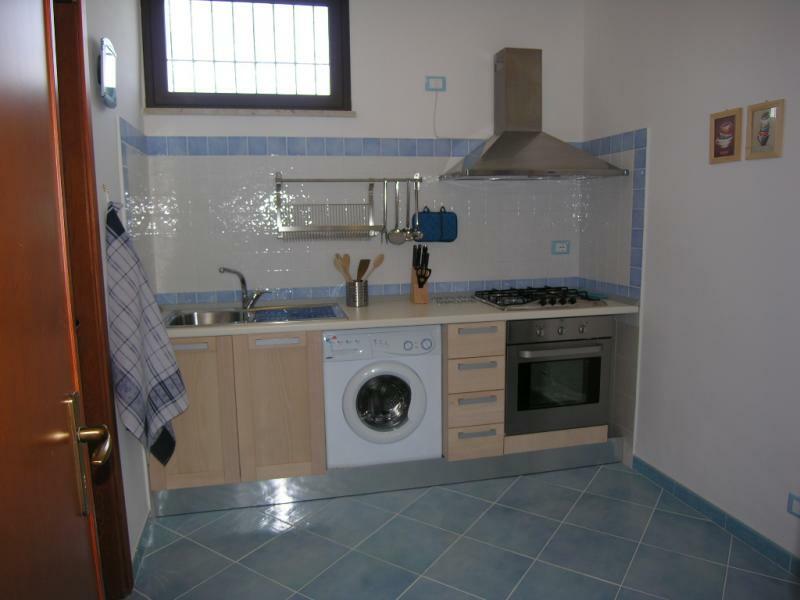 Splendido posto, casa grande, comoda e pulita. 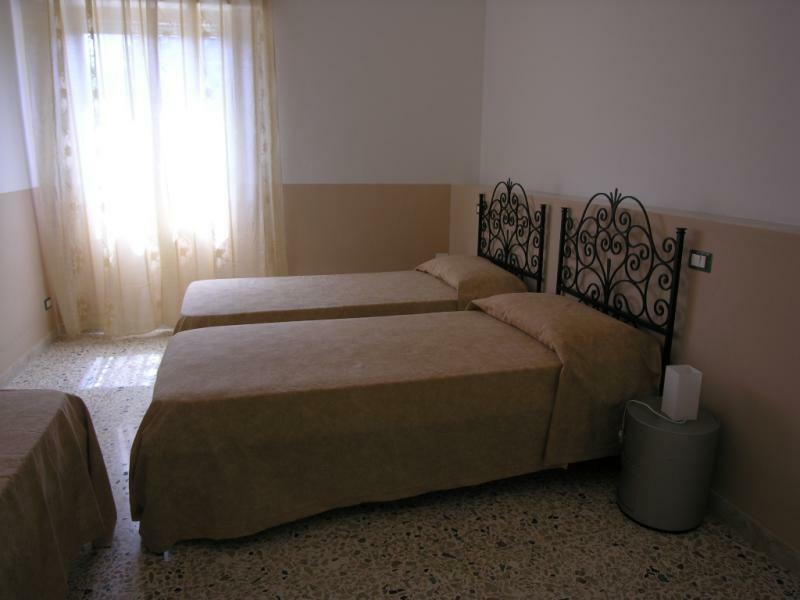 The courtesy and helpfulness of the owner and his staff helped us to spend a pleasant holiday in an enchanting corner of Sicily. Accommodation large and comfortable place for families to stay at sea in calm or starting point for exploring the nature reserve, or to explore the crystal clear beaches. La cortesia e la disponibilità del proprietario e del suo staff ha contribuito a farci trascorrere una piacevole vacanza in un angolo di sogno della Sicilia. Alloggio grande e confortevole ideale per famiglie per un soggiorno al mare in tranquillità oppure punto di partenza per esplorare la riserva naturale oppure andare alla scoperta di spiagge cristalline. My girlfriends and I spent five weeks in the delightful "Grandmother's House ", savoring every day an atmosphere of familiarity and comfort. 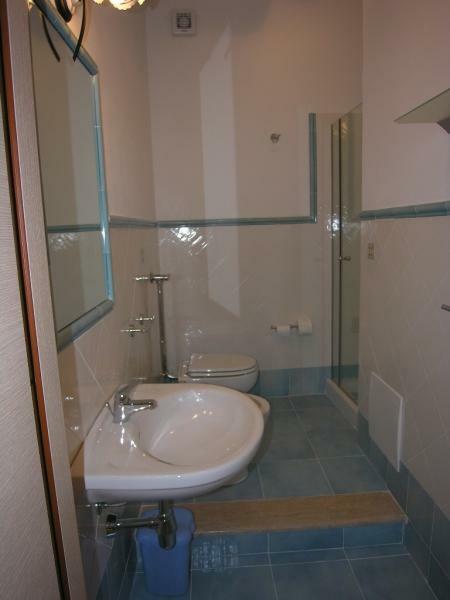 We are fond of this house, to the bright and spacious rooms and the proximity to a place of enchanting sea. The owner, Mr. Albert, welcomed us warmly, making us feel immediately at ease and proving to be helpful and cooperative. The "Grandmother's House " from the name so significant is a place where my friends and I will be back again sooner or later. Le mie amiche ed io abbiamo trascorso 5 settimane nella deliziosa "Casa della Nonna", assaporando giorno dopo giorno un'atmosfera di familiarità e di benessere. Ci siamo affezionate a questa casa, per i locali spaziosi e luminosi e per la vicinanza ad un luogo di mare incantevole. Il proprietario, Sig. Alberto, ci ha accolte con calore facendoci sentire subito a nostro agio e dimostrandosi disponibile e collaborativo. La "Casa della Nonna" dal nome così significativo è un posto dove le mie amiche ed io torneremo volentieri prima o poi. It 'a beautiful place! If you love nature, hiking in the natural reserve of Zingaro "is the ultimate "! It makes walking and along the trail, between palms, wild olives and rosemary, meet beautiful bays with crystal clear waters and blue gulf ..... try it and you will not be disappointed!! Roberto and I had a wonderful holiday and we certainly will be back. Thank you for telling Alberto recommended! " E' un posto stupendo!!! Se amate la natura, l'escursione nella riserva naturale dello Zingaro " è il massimo"!!! Si fa a piedi e lungo il sentiero, tra palme nane, olivi selvatici e rosmarino, si incontrano bellissime calette con acque trasparenti e azzurrissime.....provate e non sarete delusi!!!!! Io e Roberto abbiamo fatto una bellissima vacanza e senz'altro ritorneremo. Grazie Alberto per avermelo consigliato!" The customer had the "partner " with too many pretensions and to please have exploited the situation. In their room there was a chest of drawers that the "lady " did not want to use because you think did smell ... NOT 'TRUE, NOTHING! A closet was musty smell, a bit 'wet, but it was enough to keep it open one day and it would be passed immediately. Nothing prevented him from getting two weeks of leave. Customers polite, but a bit 'too specious the "master ". Il cliente aveva la "compagna" con troppe pretese e per accontentarla hanno strumentalizzato la situazione. Nella loro camera c'era un cassettone che la "signora" non voleva adoperare perchè secondo lei faceva odore... NON E' VERO, NULLA! Un armadio a muro faceva odore di chiuso, un po' umido, ma bastava tenerlo aperto un giorno e sarebbe passato subito. Nulla gli ha impedito di farsi 2 settimane di ferie. Clienti garbati, ma un po' troppo pretestuose le "signore".